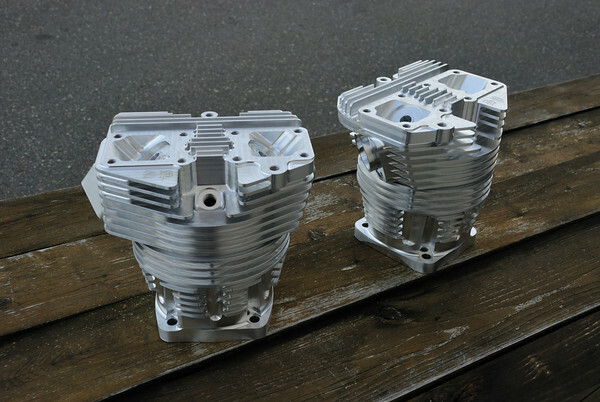 Introducing Sp's new Bigbore shovelheads ! These new heads feature Dual Decompressors for easy starting of big cubic shovels. 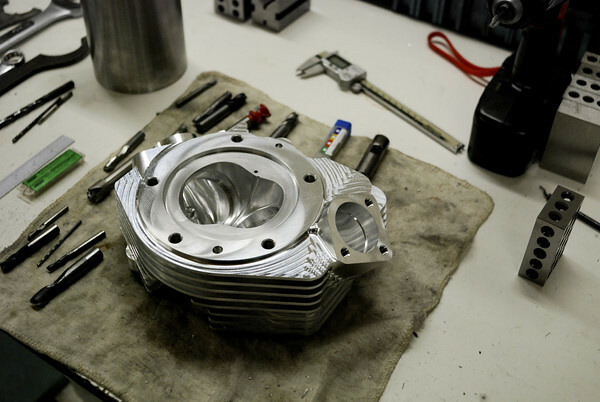 Addtional fin area for superior cooling, and updated efficient combustion chamber designed to give 9.1 compression with a flat top piston in a 128" motor. Combine these with our Billet Big Bore barrels for engines with a 4.250 bore for the baddest Shovel or Panhead the market has ever seen. Heads come standard with a 2.100 Int X 1.710 Exh. 305Cfm@ 650lift@ 28" With proper cam selection,exhaust and carburation a fire breathing 130hp+ 128" motor on pump gas is only a bolt on away. Heads use a 7/16 x 14 course thread pitch bolt. DO NOT USE FACTORY FINE THREAD BOLTS ! 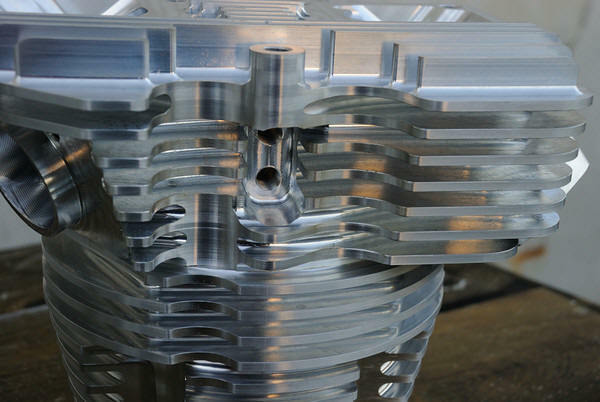 This includes any aftermarket brand of replacement bolt they will not thread in and it will ruin the threads. $2699.00 usd Satin machine finish complete PR Stage1 - 2.100x1.71 valves and handblend and flowed ports. $3599.00 usd Satin machine finish complete PR Stage 2- 2.14x1.71 Custom Machined valves and fully ported ports. 315cfm@.650 lift. $4500.00usd Satin Machine finish complete PR Stage 3- 2.25 x 1.71 Custom Machined Length valves with ports ported as much as possible.. it doesn't get any badder than this! The best flowing BigBore Shovelhead bolt on head on the market! When you absolutely must have the most HP you can have, this head is for you! Used on our 128's and 142's. 340CFM@700lift!! All heads come hand blended and the chambers hand blended. Properly set up engines should be able to run at 210lbs cranking compression with pump gas and no detonation. Dyno Testing and Tuning on request! This page was last updated Sunday, February 24, 2019 03:34:54 PM.